Man, my puns are getting bad. Hoopa, hoop? I mean come on, I’m sure I’ve already used that one before, I’m practically going around in circles! Hoopa though is something of an oddity in this set. He doesn’t seem that bad – 120 HP, 3-for-80 vanilla Psy Bolt…I mean, what’s there to make him our 2nd best card in the set? Well that Ability might have something to do with it! 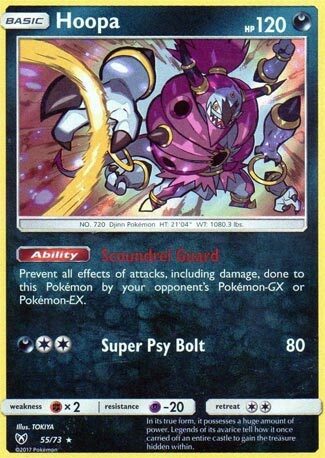 Scoundrel Guard is a Safeguard Ability that basically protects Hoopa from all effects of attacks INCLUDING DAMAGE done to him by EX and GX. And I guess being a Basic makes him better than the Stage 1 option of Alolan Ninetales (BUS). So that might have something to do with it. In fact, this guy is pretty much a straight-up upgrade over Alolan Ninetales, seeing as he is basically the same thing…but with a little extra HP and being a Basic. I guess that what makes him good enough for the list, but does that mean he’s good? Seems to me like that’s more of a maybe than anything. It’s true that Hoopa has a lot going for him – basically what Alolan Ninetales had but better with Basic access – but I can’t help feeling something’s…missing? Maybe it’s because of the presence of Garbodor in my mind, or maybe it’s those decks running non-GX/EX attackers that has me wondering if Hoopa will be effective, but it’s rather hard to say right now. I’m erring on the side of caution with my review, but it’s probably notable since any counter to Alolan Ninetales works on Hoopa. There may be a lot of decks pushing with Pokemon-GX at the moment, but that’s an environment where smaller Pokemon can sometimes work to thrive as the cheaper attacking alternatives. Hoopa’s strongly meta-dependent, and that really depends on what’s being run locally. Golisopod-GX sometimes teams up with Garbodor, Volcanion-EX has Volcanion lite, it’s really situational. Take Hoopa with a grain of salt. Arora Notealus: Hoopa is strong, but I do worry that he may be seen as a must-run when he’s really more of a tech option to shutdown EX/GX decks and punishes them. We’ll see what he can do in the long run though and if he’ll make the impression. Next Time: Wait, where the heck is our #1? Hoopa (Shining Legends, 55/72) returns to the meta in the Shining Legends expansion set. A Basic, 120 HP Pokemon, we remember the eminently popular Hoopa-EX (XY71) as a Psychic type, but this time it takes on the Dark type instead of Psychic. This has some advantages as it resists Psychic Pokemon (extremely common) and has Fighting (extremely not common) weakness. Hoopa will see play primarily for its ability Scoundrel Guard, which makes it completely invulnerable to both the damage and the effects of attacks from EX and GX Pokemon. I know I referenced my attacking analysis article yesterday, but I’m going to do it again today as well. Ten of the eleven most frequent attackers last month were GX Pokemon (and the only one that wasn’t a GX was Alolan Vulpix (Guardians Rising, 21/145)). I know I wrote about this the other day in the Raichu GX (Shining Legends, 29/73) review, but it’s worth saying it again: you need to balance your deck. Your Gardevoir GX (Burning Shadows, 93/147) maybe needs to have two Gallades (Breakthrough, 84/162). Tapu Bulu GX (SM32) does have Vikavolt (Sun & Moon, 52/149), Fire Box decks have Volcanion (Steam Siege, 25/114), and so on. Most decks do have a non EX / non GX attacker, but you really need to make sure you have at least a couple of copies of it. When I tested this with Alolan Ninetales (Burning Shadows, 28/147) back in August, I had mediocre results in “walling” my opponent, but I have recently been playing it again with Decidueye GX (Sun & Moon, 12/149) and Espeon EX (Breakpoint, 52/122) and have had quite a bit of success in disrupting my opponent and making it much more difficult for him or her to get their single prize Pokemon powered up and into a position where they can attack Alolan Ninetales. And Hoopa is even better than baby Ninetales. Ninetales is a Stage 1 Pokemon – Hoopa is a Basic. That means you can run two Hoopa for every Ninetales, and, if Hoopa does somehow get KO’d, all you have to do is find Rescue Stretcher (Guardians Rising, 130/145) and BAM the wall is back up. Obviously, Garbodor (Breakpoint, 57/122) shuts down Scoundrel Guard, and many players are now playing three or even four copies of Guzma (Burning Shadows, 115/147). However, Hoopa can be a good starter Pokemon that will stall your opponent while you develop your attacking strategy. And you can use it even if you don’t run Dark energy to attack with it, just park it in the active and take your time getting your other benched Pokemon ready to roll. No Throwback Thursday today, but instead our choice for the second best card of this month’s mini-set: Hoopa (Shining Legends 55/73). It is a Basic, Darkness-Type Pokémon with 120 HP, Fighting Weakness, Psychic Resistance, and Retreat Cost [CC], It has the Ability “Scoundrel Guard”, which states that this Pokémon is unaffected by the attacks of your opponent’s Pokémon-EX and Pokémon-GX. It also has an attack – “Super Psy Bolt” – which costs [DCC] and does 80 damage, with no additional effects. We will start with the card’s name: it may sound silly, but set-mates like Yveltal (Shining Legends 54/73) crash headfirst into this issue. Unless you needed something that could Evolve into Yveltal BREAK, being an Yveltal card forces it into direct competition with all other Yveltal cards for deck space. You know, like longtime Darkness deck loose staple Yveltal (XY 78; XY: Black Star Promos XY06; Generations RC16/RC32; XY: Steam Siege65/114). This isn’t an issue for Hoopa. Next is being a Basic; the easiest Stage to put into play, to fit into your deck, to bounce/search/etc. because they are a single card per copy and they can function as your opening Pokémon, reducing your odds of a mulligan. Being a Darkness-Type is much better in Expanded than in Standard, where it grants access to Dark Patch and a larger pool of both direct and indirect support. It isn’t bad in Standard, however; more like middle-of-the-road. What really hurts is that Darkness Weakness isn’t showing up in most (any) of the current Standard Format top decks, but Gardevoir-GX is 250 HP powerhouse sporting Darkness Resistance. At least specific anti-Darkness effects are pretty useless. Speaking of HP, the 120 belonging to Hoopa is 20 shy of the maximum printed for Basic Pokémon (excluding things like Pokémon-EX or Pokémon-GX). Most decks can swing for 120, with many able to do it reliably and repeatedly, though most can’t pull it off rapidly; that makes it a decent amount of HP. Fighting Weakness would be more dangerous if the Type was seeing current competitive success, but you’re mostly going to encounter them in budget decks, obsolete archetypes, and off-Type splashes. Psychic Resistance should come in handy as it causes that 120 HP to last a bit longer, even if only against particular matchups for both Standard and Expanded play. The Retreat Cost of [CC] is low enough you likely can afford to pay it, but high enough you’ll be hurting from having done so. Too low to qualify for stuff like Heavy Ball but low enough that something like Altar of the Moone zeroes it out completely. Of course, everything I’ve just covered, plus the attack, are all enhanced by what’s next: the Ability. Quite a few successful attackers are neither Pokémon-EX or Pokémon-GX, but many – if not most – are counting on them as either primary or backup attacker. They tend to be the Pokémon capable of swinging for big numbers, or at least somewhat big numbers reliably. Some have potent additional effects as well and… none of that can touch Hoopa, thanks to Scoundrel Guard. Note that Hoopa is not protected from attacks made by your own Pokémon-EX or Pokémon-GX, for better or worse. Opening with a Hoopa may delay your opponent a few turns, even if you’re not attacking with it, or force your opponen to expend valuable resources like Guzma. Super Psy Bolt is far less impressive but more than adequate. 80 damage for three Energy is a tad low, but requiring only one specific Energy Type makes splashing into off-Type decks plausible. When used in a Darkness deck, Max Elixir or Dark Patch can prep it quickly. In both cases, being able to make use of Double Colorless Energy is also an important feature. When you put it all together, you get an easy to run, medium-sized wall that some decks will be able to put on the offensive. Hoopa won’t be able to score OHKO’s when attacking, but if your opponent can’t get around its Ability, 2HKO’s (with Choice Band and/or Professor Kukui) or even 3HKO’s will suffice. Again, that is if you choose to even have it attack. So… why is this a big deal? Don’t we already have Alolan Ninetales? What about older examples like Sigilyph (BW: Dragons Exalted 52/124; BW: Plasma Freeze 118/116; BW: Legendary Treasures 66/113)? Alolan Ninetales is a Stage 1 Pokémon with 10 less HP; if you’re already running Alolan Vulpix and/or a source of [W] Energy, it is probably the better choice, but a slightly bigger, Basic Pokémon is otherwise the clear choice. Older options like Sigilyph suffer because they offer no protection against newer Pokémon-GX. So Hoopa becomes the new Suicune (BW: Plasma Blast 20/101). I cite it because not only does it have similar stats and effects to Hoopa, but it released after Sigilyph but still saw as much, maybe even more play as time went on. Will Hoopa become a new staple? Definitely not. It provides a wall for decks that want a wall, and can double as an okay attacker if the deck has compatible Energy acceleration (not just Energy). I exect few Darkness-Type decks should skip it, and some older porter decks probably have a new meatshield. If you’re not used to “walls” in Pokémon, be aware that most decks will have an out. Guzma is obvious and nearly every deck should be packing a few. Multiple decks shutdown Abilities and/or run enough attackers that are neither Pokémon-EX nor Pokémon-GX. A few decks will have additional, niche options like Bench hits or attacks that ignores effects on the Defending Pokémon. So for Standard play and Expanded play, it scores the same but the finer details are different e.g. access to Dark Patch but opponent’s having access Hex Maniac. You probably won’t get to use this in the Limited Format, owing to how this set is being distributed, but if you get the chance then a 120 HP Basic Pokémon you can splash into almost any other deck is well worth it, even if its Ability will rarely matter. We now come to out 2nd best card of SM Shining Legends: Hoopa! At first glance, there isn’t much text written on Hoopa’s effects, but that’s ok. But if you read what it does, then you may realize that this card is a good card. Onto the attributes: Hoopa Unbound has 120 HP, weak to Fighting, resist Psychic, and a retreat cost of two. Dark types can hit for x2 damage on some Psychic type (who represent Ghost types in the video games). Nearly all Fairy types take 20 less damage from Dark types. Hoopa has an ability and an attack. Scoundrel Guard grants immunity from EX/GX Pokemon by preventing all effects and damage done to this Pokemon. This is another “Safeguard” variant. We had outdated “Safeguard” cards that blocks whatever the EX Pokemon does such as Sigilyph, Suicune, and Carbink. Currently, Hoopa Unbound and Alolan Ninetales are the modern “Safeguard” users. And what can Hoopa Unbound do in the meantime now that the wall is active? Super Psy Bolt costs DCC and does 80 damage. With the help of some damage boosting items like Reverse Valley and/or Choice Band, you could reach 2HKO levels! Not much to say here, but an ability that was good and tested before will get used, and Hoopa Unbound is one of them! Sylveon’s Notes: Another option for a solid Safeguard user. And it’s a Basic, unlike Alolan Ninetales who is Stage 1. Coming Up: The master of illusions is back again and in its GX form! You still remember that Carbink? Yeah, that Fighting type Carbink with the Safeguard ability, allowing it to block damage from Pokemon-EXs, making it a great Turn 1 Pokemon, or a nice starter against EX-heavy decks. Now, that idea of a Basic Pokemon with that Safeguard-esque ability has been rehashed to a new meta, and it shall be a Shiny Hoopa Unbound that takes the mantle. Also to adapt in a new meta, Safeguard changed its name. This time, Hoopa-U unleashed its ring power to send the attacks of Pokemon-EXs and Pokemon-GXs into the unknown abyss, a full testament to its new Scoundrel Guard ability, which does exactly that. And with better stats, such as being a Dark type, having 120 HP instead of just 90 (Carbink BREAK only has 110! ), and also a 2 energy retreat cost (which is irrelevant as it is going to wear a Float Stone anyway like Carbink), it is just better in the prospect of being a Turn 1 wall against more variants of deck. And also as in this meta there are very little ways of shutting down Abilities, with its only problems being Alolan Muk (SM Base)’s Power Of Alchemy, Greninja (XY BKP)’s Shadow Stiching and Garbodor (XY BKP)’s Garbotoxin just a Tool away from locking down Scoundrel Ring, there are very few ways of locking out Hoopa from play. And what’s great is that it only has one weakness; it has a bad attack. That’s it. Super Psi Bolt, its attack, is just a vanilla 1 Dark + 1 DCE attack that deals 80 damage. The problem is that this attack is too underpowered for its energy cost. As bad as Carbink’s walling power now, it still has an amazing BREAK evolution that allows it to accelerate any 2 energy from the discard pile, making it an amazing energy accelerator as well as a wall. But Hoopa can’t do two things at the same time; so while it may have more bulk and better typing with a resistance to boot, Carbink can also accelerate energy while walling. Your choice. A fox in Lele level? Not sure, but it does seem like it.